Russia has begun advanced construction on a new Iranian nuclear plant that could provide Tehran with a second, plutonium-based pathway to a nuclear weapon, according to regional reports that have rattled U.S. officials in the wake of a major disclosure showing Iran lied about its past efforts to construct nuclear warheads. Russia's state-controlled nuclear agency Rosatom announced that it has begun phase-two construction on Iran's Bushehr nuclear power plant in Southern Iran, just one of several new nuclear sites that are being constructed under a multibillion-dollar agreement between the two countries. Construction on the nuclear site kicked off just days after the Israeli government disclosed a cache of some 100,000 secret Iranian documents showing the regime lied about its past efforts to construct at least five nuclear warheads. This nuclear work was later archived and codified by Tehran so that it could continue such work secretly despite the enforcement of the landmark nuclear deal. U.S. officials and regional experts said the new nuclear plant construction should be viewed with caution in the wake of Israel's disclosure and place renewed focus by the international community on Iran's clandestine efforts to use civilian nuclear sites to advance its weapons work. 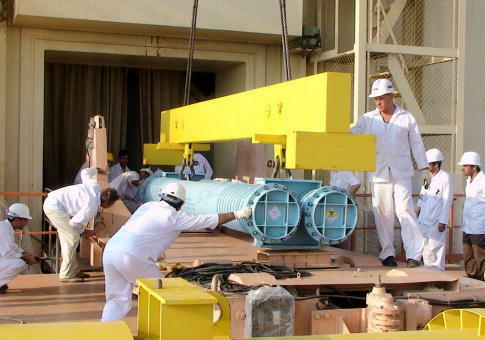 On Thursday, Russia's Rosatom announced "soil stabilization works under the reactor building of power unit No 2 commenced at Bushehr-2 NPP construction site," according to reports in Iran's state-controlled media outlets. The nuclear work is being carried out under a 2014 agreement between Iran and Russia that paved the way for the construction of at least eight new nuclear sites, including the plant at Bushehr. "Soil stabilization is one of the preparatory stages for commencement of the nuclear power plant construction required to reduce the settlement of buildings and structures of the power plant and ensuring their stability in case of possible seismic impact," according to Iran's Fars News Agency, a state-controlled press organ. The State Department declined to comment on the announcement when approached by the Free Beacon. While the construction of new nuclear plants like the one in Bushehr is permitted under the nuclear deal—just one of a series of concessions agreed to by the former Obama administration while the deal was being negotiated—Trump administration insiders said the nuclear cooperation between Iran and Russia should be reevaluated in light of Israel's disclosure about Tehran's past military work. "The Iran deal was built on the myth that the mullah's nuclear program would be confirmed as totally peaceful in just a couple of years," said one veteran Middle East expert familiar with White House deliberations on the Iran deal. "That was how [former secretary of state John] Kerry and [Iranian foreign minister Javad] Zarif sold nuclear cooperation, plus a whole lot of other gifts to Iran." In the wake of Israeli prime minister Benjamin Netanyahu's disclosure of the secret Iran nuclear files—all of which have been shared with the United States and confirmed as authentic—Tehran should not be permitted to research alternate pathways to a nuclear weapon beyond uranium enrichment, the source said. "Now that Netanyahu has blown up the myth by showing that Iran has a nuclear weapons program, it's insane that nuclear cooperation is continuing," the source said. "But of course, the whole point of the deal was to whitewash and mainstream Iran." Meanwhile, Russia has already indicated that it is not open to renegotiating the nuclear deal, taking Iran's side in the ongoing debate over White House efforts to fix the deal ahead of a May 12 deadline. Michael Rubin, a former Pentagon adviser and expert on rogue regimes, told the Free Beacon that Iran's claims of needing nuclear power are thin given its large stockpiles of oil and natural gas. "Iran will say that it wants nuclear power to produce energy, but it is floating on a sea of gas and oil which could power the country for centuries at a fraction of the cost," Rubin said. "Sure, diplomats can say Bushehr is a civilian plant. It is. But it provides cover for the import and diversion of materials for Iran's covert activities." There is additional concern about building these plants in a country prone to severe earthquakes. "The greatest hypocrisy, however, may be on the part of U.S. Democrats and European Greens who fret if a cow fart raises global temperatures a trillionth of a degree, but think nothing of allowing the architects of Chernobyl to build a nuclear reactor in one of the world's most active earthquake zones," Rubin said. This entry was posted in National Security and tagged Nuclear Iran, Russia. Bookmark the permalink.